There are few fragrance houses still as ‘relevant’ after almost 200 years as the wonderful Paris-based house of E. Coudray – which can trace its roots back to the reign of Louis XVIII, no less, and the year 1822. The Paris-born founder was a doctor-chemist, Edmond Coudray (the ‘E’ in E. Coudray), who went on to enjoy a spectacular career, creating eaux de Cologne, pomades, creams and soaps for the crowned heads of France, Italy and England – including Queen Victoria, for whom the perfume ‘Reine Victoria’ was made. Others gloried in names like ‘Gants Poudrés’ (powdered gloves), and ‘Rêve de Reine’ (the Queen’s dream). And in 1829 he also wrote a book, charmingly titled L’Art d’Être Belle (‘The Art of Being Beautiful’). At the end of the 19th Century, Coudray was appointed official supplier to the English court. By then, along with L.T. Piver, Guerlain, Lubin and Houbigant, E. Coudray was unquestionably one of the five great perfume-makers of the 19th Century. The boutique became a rendezvous for the Imperial royal family, the Marshals of the Empire and the new nobility, who swooned for E. Coudray‘s creations. 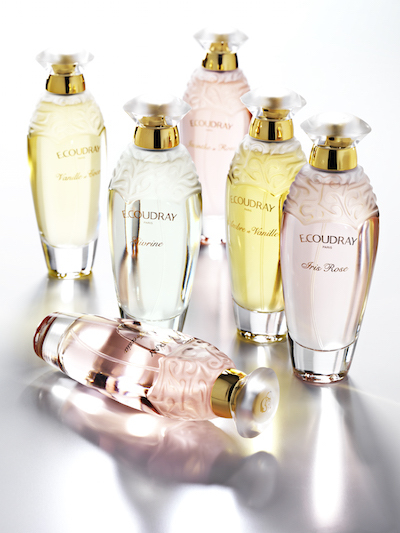 Entwined with the history of French luxury itself, Coudray opened a store on rue Saint-Honoré, in Paris – and took part in many of the grand exhibitions so popular in that era, winning two awards at the 1882 Exhibition, one for their eau de Cologne. They were famed for scented indulgences including ‘sachet powders’, for the linen closet, and for lettuce soap – renowned for its kindness to the complexion. (Queen Victoria’s said to be a fan of that, too.) On the death of Edmond Coudray in 1860, his son-in-law took over the company – which remained a family business for many, many decades and was later revived after World War II thanks to the survival of its precious formulas. Fast-forward and any perfumista who’s spent a little time in Paris may have spotted this stunning collection, with its so-feminine packaging: from the etched glass bottles to the sensual and charming fragrances, this is pure ‘boudoir chic’ – almost crying out for a dressing table to show them off. As E. Coudray observe: ‘Nostalgia has a future. A wind of modernity is blowing over Coudray and new fragrances have recently been added to the luxurious catalogue.’ Remaining true to the Art Deco design, today’s fragrance bottles are decorated with engraved floral arabesques – and the contents, most importantly, showcase the quality and exceptionality of fragrances that have delighted women since 1822. The fragrance which has bewitched us, in particular, is Iris Rose – indeed, we chose it for our Perfume Society Exquisite Essences Discovery Box. Utterly beguiling, it opens with violet leaves, iris absolute and dewy Bulgarian rose essence. As the heart unfolds, another rose note – this time from richly romantic Bulgarian rose absolute – reveals itself, alongside suede-like iris butter and heliotrope. The base lingers languidly: blonde woods, white musks, touches of tonka bean, patchouli and resinous cistus labdanum, all sweetened and softened by vanilla. While many fragrance houses have abandoned options for layering, meanwhile, E. Coudray positively encourage this way of making your fragrance last longer. (Something we’re constantly asked for advice about!) Swirl the Perfumed Bath Creams beneath running water to create the most divinely-scented soak, for instance. Follow with Perfumed Body Oil or Perfumed Body Cream, which will not only deliver satin-soft and nourished skin (thanks to a blend of plant and marine extracts), but make a beautifully moisturised ‘based’ for the matching fragrance to cling to. Longevity and sensuality are E. Coudray‘s watchwords. And somehow, can’t you tell there are women at the helm…? Sylvie Dumontier, E. Coudray‘s passionate International Director explains that today, 95% of the distributors for E. Coudray around the world are women. ‘Beautiful women: feminine, sweet, passionate…’ Chloe Amouyal, meanwhile, whose family now owns Coudray (and who’s pictured above), has the enviable role of ‘ambassador’, passionately involved with the perfume house’s future.